Fairfield Glade is full of activities that will keep your calendar full for the year. In Central Tennessee atop the Cumberland Plateau is a stunning community whose size and scope puts it in a class of its own. 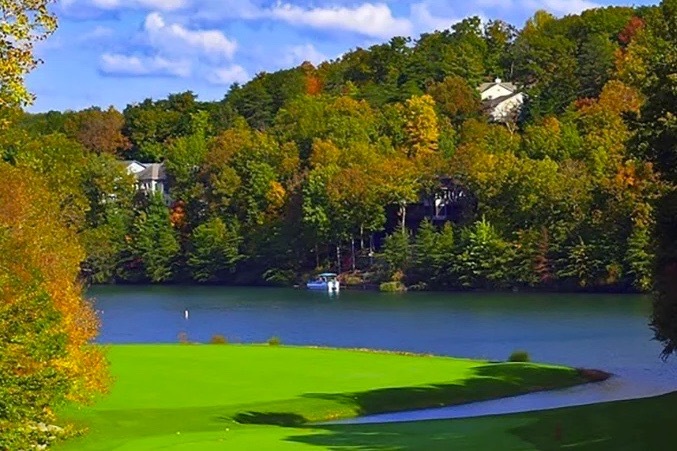 By the numbers, Fairfield Glade certainly stands out with its 12,000 acres, 90 holes of golf, 6 worship centers, two marinas, and even a stable. Its excellent location certainly doesn’t hurt either, comfortably located between Nashville to the west and Knoxville to the east. As nice as amenities and location are, it truly is the people that make the community and that’s where Fairfield Glade truly shines. After all, a community of over 4,000 homeowners can’t be wrong. The state of Tennessee is culturally, geographically, and economically divided into three distinct regions: West, Middle, and East Tennessee. Fairfield Glade lands squarely in the center of the Middle region, situated just a few miles outside Crossville, the county seat of Cumberland County. The county is named for the Cumberland Plateau, part of the Appalachian Mountain chain that gives the region its stunning geography, which ranges from gently rolling green hills to dramatic cliffs, gorges, and waterfalls, to name just a few. Fairfield Glade’s location and elevation ensure a moderate climate year round with four distinct seasons. Snow is quite rare (and when it does snow, it usually melts within hours), as is extreme heat and humidity, which is below what one would expect in the middle southern region of the country. The community itself first broke ground back in 1970 and has been growing ever since. From modest vacation homes to custom lakefront properties and homes for every budget in between, the community presently sits at around 4,000 homes with planned expansions bringing the total to 7,000 in years to come. The pace of this growth is moderated, however, with an emphasis on quality of construction over speed. There are no enforced age restrictions for the community, but there is plenty here that will entice 55-plus homeowners. A homeowners' association (HOA) provides maintenance the for grounds, clubhouses, water treatment facility, roads and other necessities. Cost of living in general is quite reasonable given that Tennessee does not collect a state income tax. Property taxes are also low compared with the rest of the country as HOA fees, as of this writing, are assessed at a very reasonable $52 a month. That monthly HOA fee covers a truly classy list of amenities that are the envy of many communities. Most prominently, the community boasts eleven fully stocked lakes, two with beaches and marinas. If this sounds great but you’re thinking “if only I owned a boat”, don’t despair. A variety of boats are available to residents for a modest rental fee from small fishing boats to large, pontoon boats that can accommodate a family gathering. If you haven’t got your sea legs or otherwise prefer to stay on land, the community features five impressive 18-hole golf courses complete with pro-shops. Stonehenge, one of the five on the property, is consistently ranked in the top five golf courses in the state. Beyond the wonderful outdoor activities available throughout the community, there is a wealth of active clubs and associations to suit any interest. In addition to maintaining a gallery on the premise, The Art Guild at Fairfield Glade also offers lessons and instruction for beginners as well as for advanced students seeking to hone their techniques. Openings and public exhibitions occur frequently, including judged and juried shows. Many of the clubs and other organizations in the area offer great opportunities for giving back to the community with volunteer activities and other community building events. As good as this community is, you’d really be missing out if you didn’t get away from time to time and explore everything Tennessee has to offer. Some of the best dining, medical facilities, and stunning parks are just a short drive away. Whether you’re looking for a day trip or a weekend getaway, Fairfield Glade’s central location within the state makes getting around a breeze. A quick trip to the east, Knoxville usually takes just over an hour to get to by car. The city is home to the University of Tennessee, several major medical facilities, and a host of cultural attractions that are the envy of towns twice the size. For college football fans, the Tennessee Volunteer’s Neyland Stadium needs no introduction with its enormous capacity of nearly 104,000, making it one of the largest stadiums in the football-crazed SEC. In winter, the legendary Lady Vols take to the court. Among the most successful teams in the NCAA, their exploits are commemorated in the Women’s Basketball Hall of Fame, also located in Knoxville. Summer brings even more reasons to visit Knoxville with events like Rossini Festival, a celebration of music and wine, put on by the Knoxville Opera that takes over much of the downtown area. Just outside Knoxville you can visit and see why the Great Smoky Mountain National Park is the most visited national park in the country. Heading west to the state capital of Nashville takes just under two hours. Known as “Music City, USA” to country music fans, Nashville’s cultural offerings are indeed world class. The historic Ryman Auditorium was long the home of the Grand Ole Opry and though the show has departed save for occasional shows, the Auditorium has been lovingly restored and plays host to major musical acts of all genres. The Grand Ole Opry’s weekly shows are now held at Opry House which has been fully renovated after historic flooding in 2010 and puts on country music shows ranging from the very traditional, to modern and Christian contemporary. If you’re lucky enough to get a sure-to-be-sold-out ticket for the likes of Emmylou Harris or the incomparable Dolly Parton, why not make an overnight trip of it? Nashville is home to some of the South’s finest restaurants, many specializing in the new Southern style of cooking that emphasizes fresh vegetables and regional ingredients. With tourism playing a major part of the city’s economy hotels, and B&Bs are as varied as they are plentiful. If it is a pleasant year-round climate, a huge variety of homes, and impressive amenities you’re after, then be sure to give Fairfield Glade a good look. In many ways, it is quite fitting that this amazing community sits right in the heart of Tennessee. Much like the state itself Fairfield Glade is bathed in natural beauty, buzzing with activity, and imbued with a neighborly Southern charm that makes it easy to feel right at home.